This page provides information for persons who have a Barnum ancestor born prior to 1850 and are participating in the Barnum Family DNA Project. 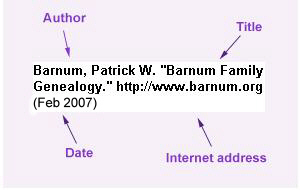 Persons who are researching the Barnum surname but are not participating in the DNA Project can be found on the Barnum Family Researchers page. 1) Include “Barnum Family DNA Project” in the subject line of your e-mail. 2) Provide your Y-DNA test data or a link to the site where it is posted. 3) Provide your Barnum line of descent as far back as you have documented it. 4) Be willing to share that information with others. 5) Provide your name, e-mail address, and URL if you have a website; your address and telephone number are optional. Additional contact information will be added as each new participant joins the project.